The Stefan Żeromski Theatre housed in the historic building at Sienkiewicza Street is currently one of the most attractive spaces for the performing arts in the City of Kielce. The elaborate façade and rich building interiors constitue the valuable historic substance reinforcing the prestige of the place, which is why the design activities have brought the values of the existing space to the fore, drawing out its exceptional ambience so characteristic of ‘high culture’ space. 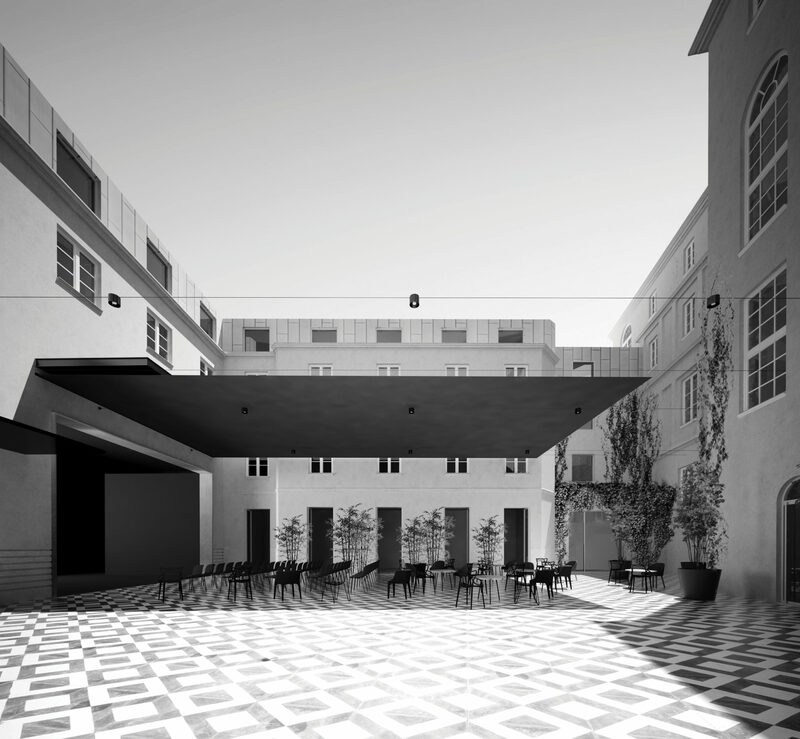 Apart from adapting the facility to the requirements of a contemporary theatre, the concept also provides for the creation of new possibilities for presenting performances along with new spaces for the contemplation and discussion of art, both inside and outside the facility. The current functional structure of the building creates a relatively awkward and non-intuitive entrance area, which remains inaccessible for persons with disabilities. 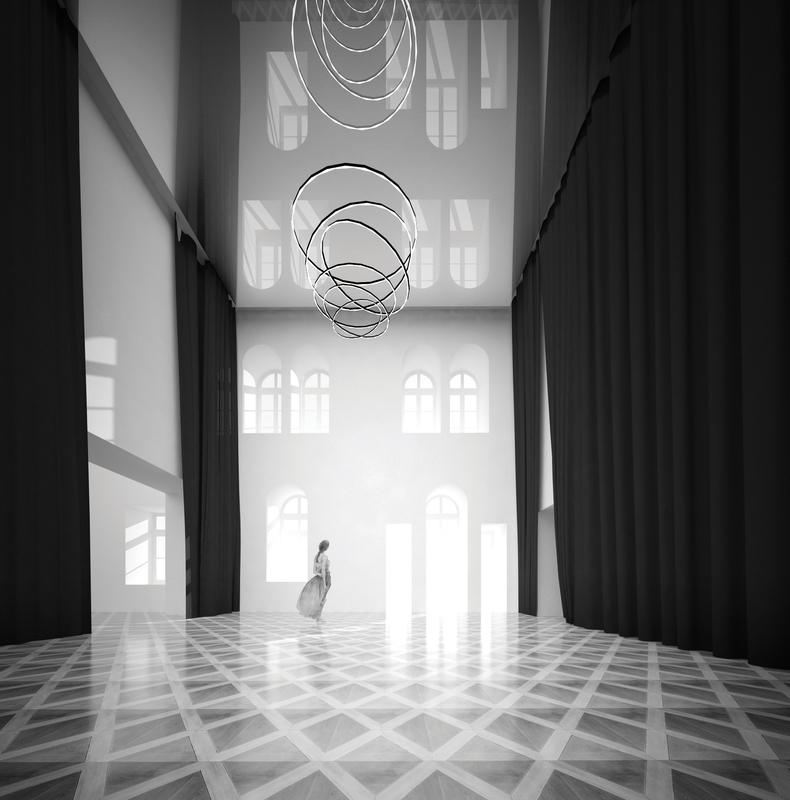 The entrance hall will, therefore, be extended by connecting adjacent rooms, opening up into a spacious cafe with a reception and info-point function. 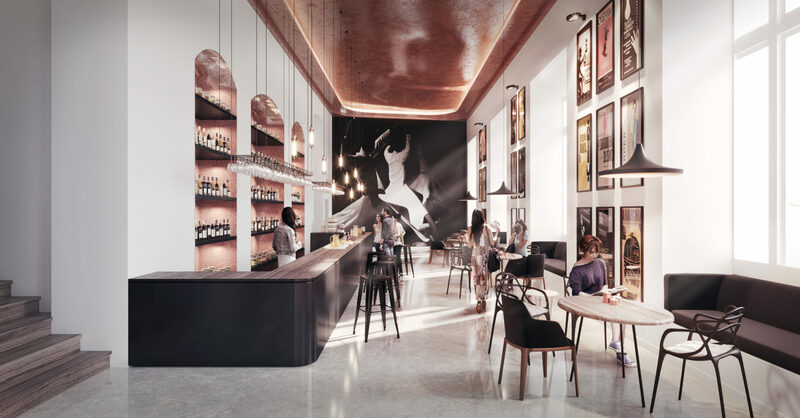 Its location next to a walkway with a separate entrance from Sienkiewicza Street will ensure that more users and visitors will be accommodated, bringing them into contact with art through the cafe interiors reflecting the life of the theatre. The representative interiors of the cafe have been emphasised by the use of high-grade precious materials – a stone floor with copper adorning the ceiling, making reference to the lavish, gilded ornamentation in key places throughout the theatre. Copper in the design concept is the equivalent to gold and is the leitmotif of the building interiors, forging the character of the most important spaces – the entrance hall, the foyer, and the big and small stage. The architectural concept of the interiors is to retain all the historic elements of the hall decor like balconies, gantry, pillars, and the character of the auditorium. The sound and lighting technical aspects of the stage have been organised so as not to obscure the historic features of the original design but to bring out their true aesthetics and value. 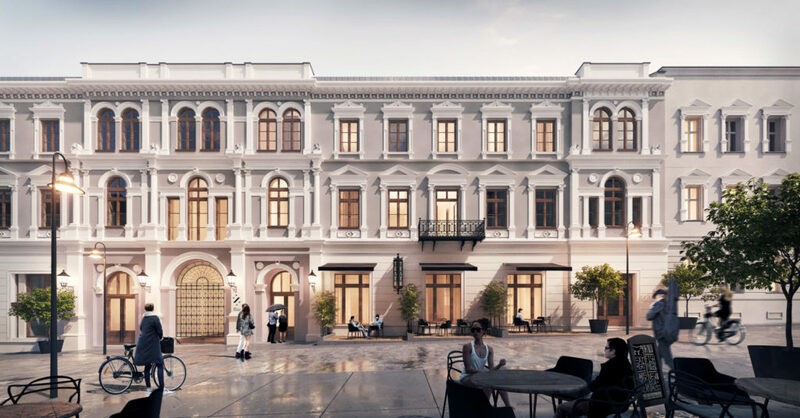 A shimmering gold plafond arrangement referring to the present historic plafond will be a contemporary addition to the historic interiors. It will also have a decorative role apart from its acoustic function, continuing the rich interior decor of the hall. The lower audience level has been reconstructed to raise the level of comfort of participation, ensuring adequate visibility with a C-value of 6 cm, retaining the staggered seating arrangement. The proper slope of the auditorium was obtained by lowering the level of the stage to keep the required 13-metre useful height of the stage without having to build any distinct superstructure or change the roof pitch. The geometry of certain historic elements had to be altered in connection with the adjustment of the auditorium slope to the visibility requirements, which is why their supplementation has also been foreseen using original elements. The inner courtyard is currently only used for technical and support functions. 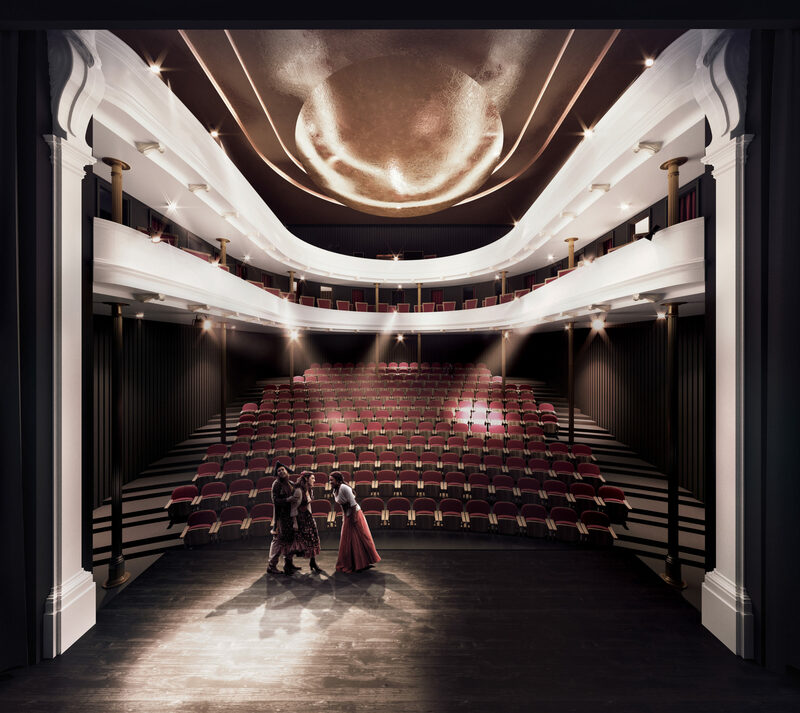 This design concept envisages the creation of an additional inspired meeting and event space in the courtyard for theatre guests or support and theatre staff, retaining its necessary technical function in its western part. The eastern part has been earmarked as a space for organising outdoor events and performances. An additional stage window for the small stage looking out onto the courtyard enables non-standard performances to be held with an optional buffet catering service possibility in the foyer of the hall. The new ground-floor openings in the eastern outbuilding have provided a connection with the courtyard and enlivened its interiors. The interior architecture aims to give them a more distinguished air, which will take on the role of a salon thanks to its new functions. Hence, there will be a stone mosaic floor and a suspended lighting arrangement will perform the role of the ceiling. There will be a roofing possibility over the event area in the courtyard so that performances and events can take place regardless of the weather conditions. 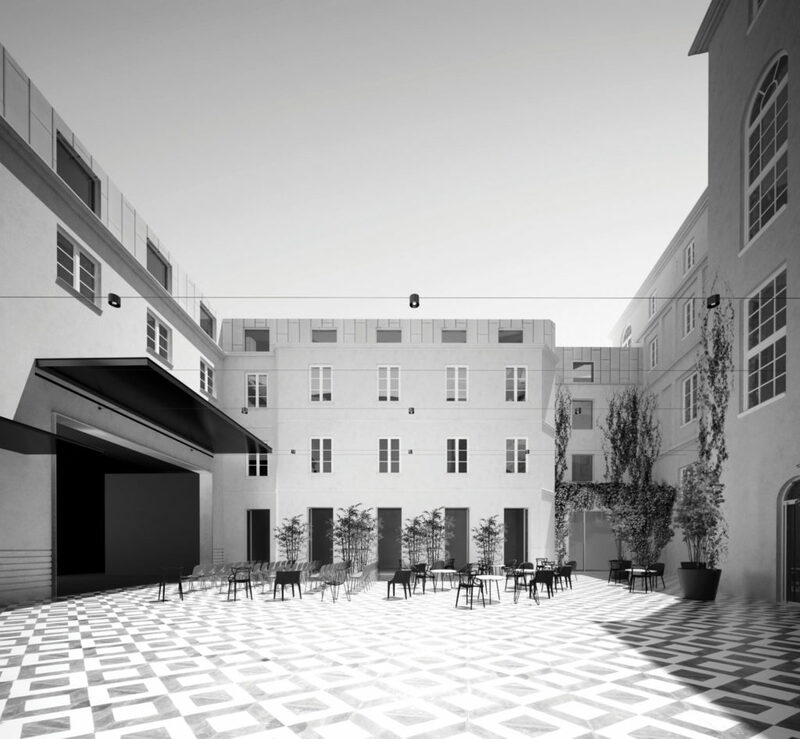 The courtyard area, in view of it being fully adaptable to different functionalities, will cater for performances and deliveries; its development will be flexible and mobile while the foliage has been arranged in vertical planes using ivy and slender shrubs. 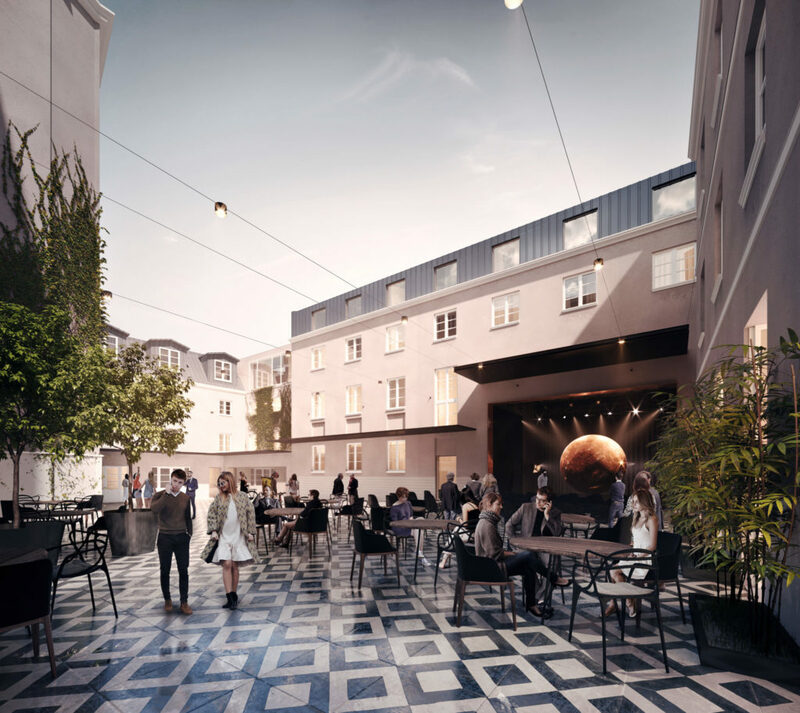 The technical theatre area for the stage management and delivery of set decorations was designed for the western part of the courtyard, facilitating smooth deliveries and communication infrastructure via the entrance gate. Roofing over the area leading up to the window of the small stage was also designed to facilitate the transport of decorations from warehouses and the technological line. All the actions taken within the building are designed to retain as much of the historical substance as possible, while keeping the new matter toned down to perfectly fill the gaps in the compact structure. 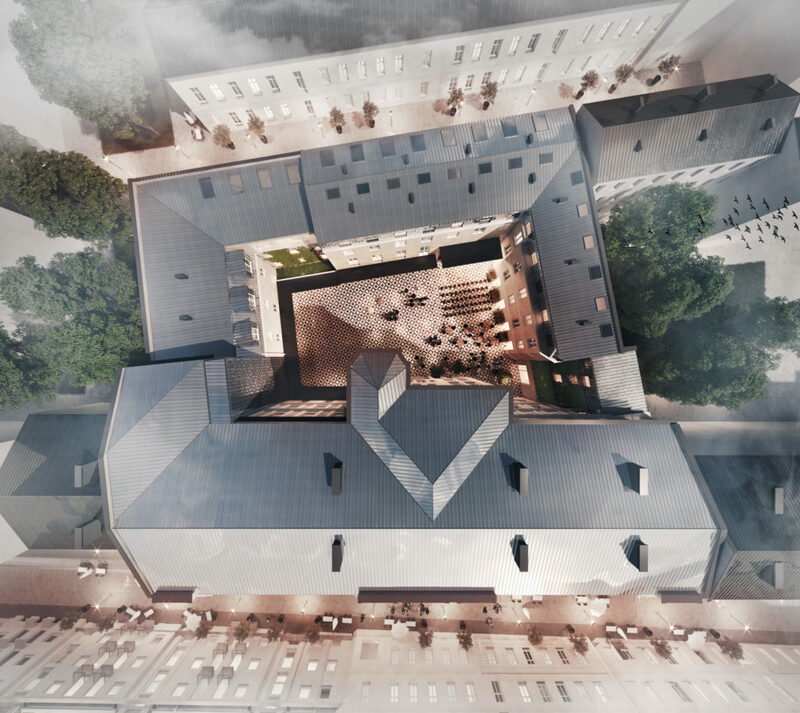 The facility was extended in the north-western and north-eastern corner, while the roof was raised in the north and eastern outbuilding, thus, maximising the space for the hostel and common areas. In the event of a raised roof in the northern outbuilding proving to be impracticable due to significant overshadowing and shading of adjacent buildings, there are several roof cover options available.